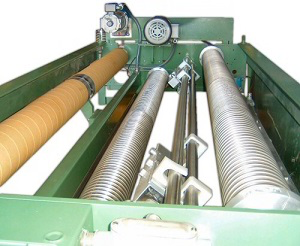 Tandematic engineers and manufactures innovative low tension, “hands-off” fabric handling machinery. Tandematic, a Navis Tubetex brand, is located in Lexington, North Carolina, where we specialize in the design and engineering of systems for innovative low tension, “hands-off” fabric handling systems. Founded in 1976, Tandematic has manufactured fabric storage and guiding, selvedge decurling, stenter rail guiding, pinning waste control (a unique concept for increased fabric yield), “top surface” gum application, and shear cut fabric slitting/selvedge trimming. New to the Tandematic family are systems for use with webs in the converting industry: storage, “Mantis” in-line web positioner, shear cut trimmer/slitter, turret unwinder. With over 40 patents covering its technologically-advanced web control equipment, Tandematic continues its engineering advancements today by evaluating customer concerns and developing cost-effective solutions. Learn more about Tandematic’s line of products. Tandematic also offers products for the converting industry – click on a product below under “Paper and Film Conversion” to download flyers. ln 2007, CDFL Mauritius installed 3 Tandenmatic edge decurlers and 3 Tandematic off-pin trimming systems onto the three existing Monforts stenters, one of which was barely 9 months old. We had been experiencing higher than normal stoppages for blade sharpening and exccssive selvedge loss at trimming on our knitted fabrics. The Tandematic systems had an immediate impact on performance. We gained 2 cm’s of fabric at each selvedge and only had to turn the trimming blades after 5 months use, 23 hours per day, and 24 days per month running. I would recommend these systems to anyone. They are the best of their kind that I have seen in over 30 years in the textile industry. Les Raynor , GM – Consolidated Dyeing Co. Ltd.
Tandematic Cutting Unit at machine exit. Tandematic Rail Guiding System at machine entrance. Tandematic Gumming Unit at dryer entrance. All of these units have greatly improved production levels and have also resulted in a higher quality fabric, which has lead to increased confidence by our customers, which in turn has resulted in better order intakes. These units have also greatly reduced the amount of waste and chemicals used during the stentering operation. Furthermore, the whole programming from initial enquiry to the commissioning of the units was handled very professionally and with no problems. The technical backup, as well as installation has also been of a very high standard. I would not hesitate to recommend these products to any other textile mills that are considering adding value to an older stenter range. G. Ginsberg, Director – Mediterranean Textile Mills (PTY) LTD.
As the above advantages were immediately apparent, we decided to fit identical systems to our other two stenters in terms of both decurling, waste management and off stenter trimming systems. The payback period was less than 4 months in terms of the capex investment proposal in all three cases. We have no hesitation in recommending the fitment of this Tandematic equipment as a standard either onto a new stenter purchased or on an existing stenter where the non-Tandematic equivalents are usually found lacking. Copyright Navis TubeTex. All Rights Reserved.